Investigative journalist Michael Ruppert (above) was shot dead on 13 April 2014. In the summer of 2006, fearing for his life, Michael Ruppert fled from the United States. When he died he was living in Colorado. Reportedly, he had said that if he died it would not be suicide. His organisation had reportedly been infiltrated. In 2004, investigative journalist Gary Webb (above) was found dead from two gunshot wounds to the head. 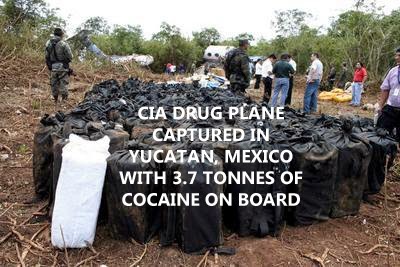 Both Ruppert and Webb had exposed CIA drug smuggling. In 2006, Michael Ruppert (above) wrote: "Goodbye to the United States". By The Light Of A Burning Bridge - From The Wilderness. "It was thirty years ago that my then-fiancée, a career contract agent for the CIA, disclosed to me that 'her people' were interested in giving a major boost to my career with Los Angeles Police Department if I would become involved with her 'anti-terror' operations that involved 'overlooking' (i.e. protecting) large drug shipments coming in while facilitating the movement of large quantities of firearms going out. "The U.S. is a nation of the corporation, by the corporation, and for the corporation. "Fascism always becomes more vicious as it evolves..."
Mark Lombardi who documented the Bush-Bin Laden family money laundering operation. J.H. Hatfield who documented George Bush Jr’s drug abuse. Danny Casolaro who documented a criminal network that involved the Bush family. Did he takes his meds? Did he not take his meds? Who whispered in his mind-controlled ear? the head -- two times? promoted by the Club of Rome as early as the 1970s? Anon, is there any way you could post a (.xml) file (copy) of your two sites? With copyright restrictions attached, of course. I have the program "Httrack Website Copier" installed, but it would take days, if not weeks, to download your entire site(s). I also checked the "Internet Archive Wayback Machine", however, it will not display all of your posts, claiming: "Page cannot be crawled or displayed due to robots.txt." Nice to see you back up! There is a way to upload and post (.xml) files anonymously at FileTea (https://filetea.me/default/). I used to read the From the Wilderness web site regularly in the early 2000s. Sorry he's now gone. Michael presented his reports about CIA/FBI involvement in drug trafficing and the US-financial industry laundring money very convincing, he did so with a strong human touch. He presented also a lot of evidence, that the era of cheap energy will come to an end soon. He stated at one point, that Henri Kissinger would have said „if we can't adapt the energy resources to the world population, we have to adapt the world population the the energy resources.“ The daily reports in the Bloggers-sphere are certainly an overwhelming confirmation of the intentions of Kissinger and his tribe in that respect. for what it's worth the official report has him in Calistoga, CA at the time of his demise. I read your postings daily - thank you for the great work you do. I have a list of people who were killed by the elites and it includes Phillip Johnson, Breitbart, Michael Hastings, Ron Brown, multiple witnesses to the bombs going off on 911, and any one who crosses the administration in charge if not protected. This is not the America I know. God help us all. It is going to get much worse. aircraft downings not just at Mena.